The Mount Etjo Declaration was signed in 1989 under the supervision of the United Nations, signaling the dawn of the Republic of Namibia. Fittingly for such an occasion, the name means "place of refuge". 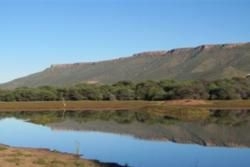 Located on the northern route towards Otjiwarongo, the mountain range is true to the nature of the geological wealth of Namibia. A rich diversity of flora and fauna is also present with species such as Hartmann’s mountain zebra and klipspringer to be seen. Dinosaur footprints can also be viewed, their age estimated at around 230 million years old.